Most calls we receive for muskrat removal come from homeowners associations or apartment complexes. We have had a few customers with their own private ponds. 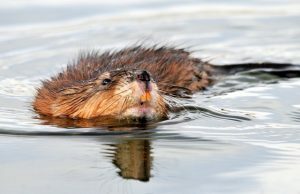 Muskrats tend to dig a burrow along the waters edge, just below water level. These burrows can be a real nuisance. Anyone walking along the bank or edge of the pond can step on a burrow and end up with their foot going into the ground. The waters edge or bank is eroded and lost over time. Muskrats in large numbers can eat all the vegetation out of a pond. The lack of vegetation in the pond, lowers the oxygen level. A low oxygen level may cause fish to die. The end result is a dead pond. It may take years for a dead pond to recover after muskrats are removed.